Hacksaws are hand tools used primarily for sawing and cutting different types of materials. These are a must-have in the toolbox of construction workers, carpenters, plumbers, and the do-it-yourself individuals. There are different types of hacksaws in the market and the most popular ones come with 10-inch and 12-inch blades. You can also find smaller sized blades and they can also be as ideal as those that have bigger blades, with a sturdy frame and high-quality construction. 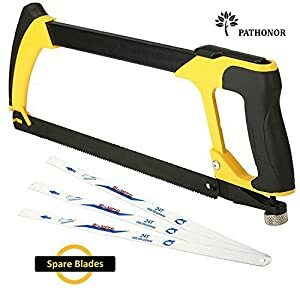 How to Choose a Suitable Hacksaw? This tool comes from a brand that needs very little or no introduction at all, DeWalt, which is synonymous to high-quality construction, exceptional performance, and longevity. The DWHT20547L 5-in-1 hacksaw is one of the company’s finest and most popular products for the construction and renovation industry. It comes with all the attractive features and trimmings you could expect from a top-end hacksaw. This DeWalt tool has a high tension blade that you can stretch up to a maximum of 330 pounds. This allows you to effortlessly cut through steel and other abrasive materials without moving unsteadily from side to side. The blade is also ideal for making both straight and flush cuts; it is 90 and 45 degrees adjustable. The handle provides a rubberized grip, making it comfortable to hold. Moreover, compact design and lightweight enables you to work in tight spaces. 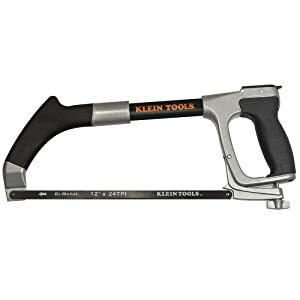 Klein Tools is another highly trusted and reputed brand in the hacksaw industry. They are famous for making the best hacksaws used in home construction, improvement, and renovation. The 702-23 model is one of the company’s best creations, with a 12-inch blade and 6-inch reciprocating blade. The machine is able to adapt to the dual function of two saws in one. Another impressive attribute of this Klein hand tool is the impressive and excellently performing 24 tooth per inch (TPI) 12-inch blade. This TPI allows the blade to quickly and effortlessly work through a broad range of materials, from light plastics to the hardest metals. The blade has been designed and engineered to function effectively in bi-metal cutting, especially in spots that are awkwardly hard-to-reach. The user can increase tension on the blades for up to 30,000 PSI. The two handles are constructed with industrial grade aluminum material and are also rubberized. They provide a firm hold, which ensures that the user finds the tool easy and comfortable to use in handling different types of materials. Bahco is a brand that may not be as popular as the DeWalt and Klein Tools, but it offers a product that is worth looking into, as its performance clearly rivals the best products of the above 2 brands. Whether you are a professional craftsman or an enthusiastic DIYer and you are looking for the best achievable performance, ease of use and practicality, this is the hand tool for you. It has all the bells and whistles that you would expect in a hacksaw in its compact and lightweight frame. The tool is easy to use and its perfect balancing helps mainly in minimizing cutting time by a notable percentage. At the very beginning, I would say that using the machine is an extremely easy task. It also comes with two grips, as in my top pick #2, both rubberized and with an ergonomic design, which enhances the comfort and ease of use. So besides reducing the chances of slippage, during an operation, you can also avoid experiencing hand fatigue and strain caused by long periods of use. The compact and lightweight frame offers perfect movement and direction in difficult to reach spots. Finally, for the purpose of longevity, the Bahco 325 features an all cast aluminum construction. This model has several desirable qualities and features, but the high-quality construction stands out from the beginning. The steel material used gives the tool the capability to take the beating, when used to cut the hardest and toughest materials that you can ever find. The high-tension blade guarantees accurate, precise and fast cutting, besides protecting from twisting or breakage, while working with it. 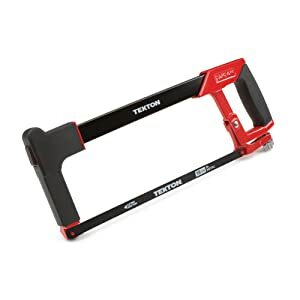 To provide ease of use, the Tekton 6823 hacksaw has a lightweight and compact, comfortable to hold and non-slip handle. This feature also contributes to ease of use. Some other premium features of the machine include the rugged and long-lasting alloy frame, the blade is great for straight and flush cutting and adjustable to 40 and 90 degrees, storage compartment in the main beam for back-up blades and the tubular steel main beam for longevity. In spite of all these aspects, you will find this hand tool quite affordable. Being a low-cost product, this can be interpreted as something that is less durable or poor performing, or less productive. However, this is not the case with this Stanley STHT20138 solid frame high tension hacksaw. In fact, it is liked and loved by its users including contractors, carpenters, plumbers and other construction workers for its endearing features. This hand tool boasts of its durable blade that can be effortlessly adjusted to a range of 90 and 180 degrees, a big difference from the 45 and 90 degrees of other hacksaw range. This augments the tool’s usability and saves a great deal of effort and time during the process of cutting and sawing. More than that, it makes the otherwise difficult task of flush cutting an easy undertaking. This is especially true when you consider that the blade has a remarkable cutting depth of more than 4 inches. The machine is also compatible with a majority of blades. You can add to these attributes like ease of use, affordability and long lasting construction. This package is highly irresistible, particularly when you are looking for combined qualities of value and performance. 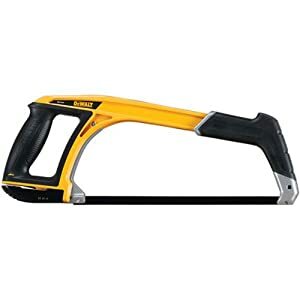 This brand/model is a multi-functional hacksaw set that can perform the functions of several tools. It was designed to find a way around the difficulties encountered by construction workers, who perform a wide array of tasks and need to use various tools during their day at work. They find that switching from one tool to the next is laborious, time-consuming and also less productive. The Pathonor hacksaw is the result of the company’s desire to circumvent this obstacle. The blade is tough, it makes the way for a smooth process of cutting through different materials – stainless steel, ropes, bamboo, soft metal, rubber, plastic, thick wood, and many others. There is a blade designated for different materials. Additional characteristics of the machine include being compact and lightweight, hence it’s highly portable. It makes it easy to store at the end of the working day. Straight and flush cutting is made easy by the innovative design that can be rarely found in the rival tools. The package includes a blade sharpener. And finally, it is a very affordable hand tool. This hacksaw by Lenox Tools makes cutting easier, accurate, quick and more fun. This hand tool has every feature and specification that an experienced craftsman would like to get, whenever they are in the market for a perfect tool. While the frame is compact and lightweight, it is unexpectedly durable, sturdy and rugged. It contains a holder for the spare blade, for the times when you are working on particularly hard and tough materials at the construction site or at home. 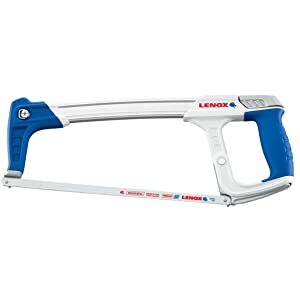 Other interesting aspects of this Lenox hacksaw include affordability, ease of use, rigidity, flexibility and accurate cutting. The design enhances the usability significantly, by having a soft, rubberized handle grip. This reduces hand fatigue and strain. It has high-quality I-beam construction that makes sure that it can handle even the heaviest use under different conditions and in multiple settings. The tension of the blade can be increased to a maximum of 50,000 pounds, per square inch (PSI). Making a single purchase of hacksaw is never going to be easy, especially for people who do not have the knowledge and experience in its use. This is the reason why I have decided to put together this information, with the hope that it will help you make a sound buying decision. All the hacksaws that I have reviewed are all efficient and outstanding in every aspect. All you need to do is narrow down your choices, by considering your cutting and sawing needs and you will get the tool that you need and want. If your work requires that you cut brass and steel and other abrasive materials, do not settle for nothing less than a highly constructed hacksaw that can surely remain unaffected and undamaged by the demands of your job. For this purpose, you got several options. Some brands and models out there use industrial grade materials, such as steel and aluminum alloy and some have I-beam type of construction. 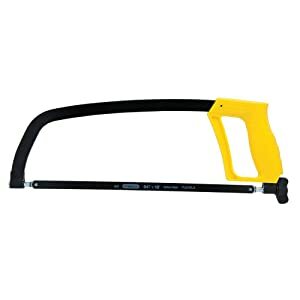 The construction material of the hacksaw has to be resistant to damages caused by corrosive materials that you can find in most workshop settings. Instead, it should contribute to the durability and long life of the hacksaw. It will be an expensive mistake if you compromise on the quality of the construction of the tool because you will be looking for a replacement after several uses. Relative to the above, always remember that an adjustable hacksaw frame is better and more flexible than the fixed frame, which only accepts blade of specific lengths. The adjustable hacksaw frame can work with various blade lengths. Regardless of what frame you opt to buy, make sure that it has a sturdy metal construction. The blade quality is another aspect of the hacksaw that you need to give your full attention to. Seasoned craftsmen and construction workers deserve to have on their side an efficiently performing hacksaw all the time. Unlike the DIYers and the weekend warriors, these professionals work on a wide range of materials. The machine that you should choose should be able to accept different types and lengths of blades, so you can work without hassle with all kinds of materials in the shop. Consider the tooth-per-inch (TPI) of the blade. The higher the TPI, the more accurate, quicker and the neater the finish of the material will be. Choose also the blade that has superior edge retention, so you don’t spend more time and effort in cutting and sawing various material pieces. More features are incorporated by hacksaw manufacturers to their products, for the purpose of making these items appealing to a vast majority of users. There are certain features that make these tools easy and convenient to use, even at extended hours of cutting and sawing. The brands are not only meant to attract those who are new or inexperienced in the use of this tool, but also to the seasoned professionals. Some of the features that you should look for to determine the ease of use of the hacksaws include the handle design, blade tensioning mechanism, and other physical attributes. 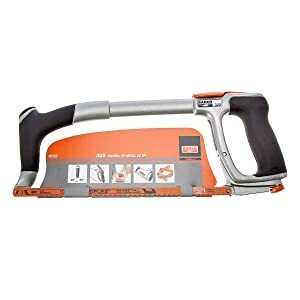 Some hand saws come with just one handle; while others have two, providing you with a two-handed operation when the project to be done requires more force. Whichever you choose to buy, make sure that the handle is comfortable to your hand/s, even when you use the tool for an extended period of time. You lessen the possibility of experiencing hand fatigue or straining. Choose the handle with rubberized grip for added convenience.